Hugely under-rated, Gabriele Tarquini never had a Formula One car to match his ability. 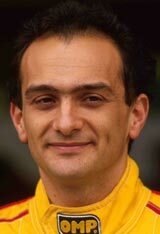 He caused a sensation in 1985 when, as reigning World Karting Champion, he went straight to Formula 3000 and became a front-runner. Yet it wasn't until 1987 that he got to Formula One, initially with Osella and then Coloni. Drafted in at AGS to replace the injured Philippe Streiff in 1989, he scored a point at Mexico, but AGS slipped further down the grid over the next two years. He drove for Fondmetal in 1992, but success was thwarted by financial problems, and the team dropped out of Formula One. He left Formula one with 38 starts from 78 races entered, but earned an unwanted place in history by failing to pre-qualify 24 times, a record he seems destined to keep for a long time. He enjoyed considerable success in other forms of motorsport, winning the British touring car title in 1994 for Alfa Romeo and the European title for Alfa Romeo in 2003. He also won the WTCC championship in 2009, finishing second in the year before and after.